The Process Historian is a very simple but useful tool for operational excellence. It has one function it gathers real-time data from control systems, compresses the data for massive storage, and stores the control system data and a time stamp electronically. The historian also provides a method or way to query the data to pull time series information for display or use. The purpose of this article is to describe the uses for this tool in manufacturing and associated functionality that is built into “historian systems” to make the process historian more useful and valuable to the customer. The process historian came about as digital control systems began replacing pneumatic controls. As the old bench boards of pneumatic hand-stations were tossed for computer based Operator Interfaces all that was left were the chart recorders. The Ink filled recorder that created trends of process variables on paper were used by operators to “see trends” in the process variables as well as to keep records – sometimes for years – on the process during production. The automation companies provided short-term trends in their control system “operator interface” assuming that was still the primary function of the process historian. They fumbled the ball on the electronic replacement of chart recorders by not providing longer storage and more flexible trend tools – but many others companies did not. That is why the modern electronic process historian still has the basic functionality to gather, time stamp, compress, store, and provide a method of retrieving the data from the historian. Along with the actual historian software all historian vendors also provide trending tools to duplicate the chart recorders. 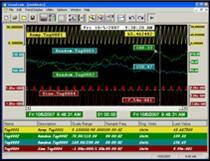 Hence the historian provides the long-term data of how the process was running and the trend software provides the replacement for the chart recorder to the operator. Not too many years back all trending software was proprietary and tied to proprietary historian. Thanks to standards like OPC-UA and OPC-HDA both technically and practically the historian and the trending these are separate software solutions. Open tools like HMI (human-machine interface), Manufacturing Intelligence software, Performance Management Systems, and a plethora of trending, reporting and other independent tools can all connect to any process historian data using the OPC standards. How do you compare the quality of one historian to another? When a vendor discusses the quality of a historian there are only three areas to consider. First and most important is how well the historian performs the basic functionality of a historian in gathering, time-stamping, compressing, storing and their ability to retrieve data. Not all popular historians are fast at storing or retrieving data and some rebuild data based on interpolation of what was stored – not the actual values. This is not a problem for most of the industrial manufacturing uses of historian to see trending of temperature, pressure, level of process data. However, for some companies that want to use the historian as tool for root-cause analysis of months of very high speed data that is being stored – reporting may be slow and interpolation may hide real data points. First and foremost make sure that the historian is fast enough at storing and retrieving data for your application. The second area to review when looking at process historians are the features that are built into the “system” and user tools available. This is interesting because some of the older, more expensive, more proprietary systems have years of adding features to enhance the user experience with the historian and they usually have good but proprietary trending and analysis tools. Some of the extras that should be considered are things like redundancy of historians, store and forward, and the ability to easily calculate and store min, max and averages of tags. My experience is that few plants need this capability but many managers are conservative and think they need it. So, these features are worthless if not needed but may dictate your historian choice if they are necessary. Another capability is the ease of allowing the client to write calculations in the “historian system” to be calculated and stored in the historian on the fly. Some historians have “features” that will only work with other products by the same vendor such as trending tools, tag importation for configuration, etc. I consider these to be “sticky marketing” and not a sign the company has a product that can compete on its own very well. The third area of attention should be use of industry standards. If the historian will not read data from an OPC server – that is not a good thing. If the historian will not render data to an OPC server that too is a problem. User tools are important and it is known that some of the big boys of process historian world have some pretty good proprietary historian tools. However, a client has to know that a historian that has to have multiple extra layers of software servers to get to an industry standard is betting against the rest of the world. Today there are hundreds of third party programs from loop tuning to SPC to trending to Excel reports that are built to read data from any OPC compliant historian. This does not need to be overemphasized because you can get servers to work with almost any historian – but many uses are not aware of the vast array of their party tools that work with historians. Clean methods of getting data into and out of the historian and seeing it in a Trending or Reporting tool that works is very important. Amazing things are happening in the world of process historians. When I worked at a paper company in 1991 we paid $100,000.00 for the hard drive to store a year’s data on our process historian. Today, the SD drive in my cell phone stores twice the data as our process historian hard drive. Clearly data compression is not as important as it once was but the other side to this is that good historians can be cheap and small and even distributed. But don’t take this too far either – just a couple of years ago at least one of the major automation companies sold a “historian” system that basically did not have any data compression and slow data retrieval. Today, another global automation company makes it too attractive to use their data historian along with the PLCs – yet they have one of the slowest and worst rates of retrieval of any historian. This said – process historians can be inexpensive from specialty companies that have been in business for many years. Before buying the historian being marketed by the global automation company take a look at Canary Labs. You may get a better historian for half the cost. We have already mentioned two of the primary uses of the process historian. One is to provide long-term storage of process data that may be needed for compliance. 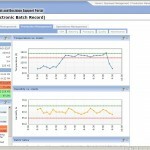 Another is to provide trends of process variables in a continuous process for the operations team. Implied earlier in this article was the use of the historian trending and data by people other than the operators. A major market for historians and historian tools is to provide a view of process information that allows engineers, management and experts remote from the process to see how the process is running and where improvements are needed. The ability time shift a trend and layer it with other trends of process variables is an excellent way to see cause and effect in a process. Tools for the process historian can show real-time data, drive process graphics to “replay” data like a virtual Video Recorder, or do statistical analysis of the data. These are all strong uses of a process historian. Beyond process data an excellent use of a historian is to collect and store energy use, effluent discharge, waste discharge rates, sewer and potable water information. The data can pulled from the historian and correlated by the time stamp to show excellent reports of average and total energy use, steam use, or waste by shift, day or month. Many companies use Excel or other reporting tools to produce reports. The most important consideration for the use of a historian is that you are working with time-series data in every case. An important aspect of time series data and trending is that it takes human cognizant skills to see a relationship and then to “know” what to do about it. The human adds the Intelligence to the system. There are process experts that advocate surrounding the operator with displays of hundreds of process trends with the reasoning that by seeing them day in and day out they will detect a difference and act upon it when there is a problem. I never questioned the detection of problems by osmosis – I always questioned the “act upon it” part. But I have seen this used in a pulp mill where the operations team was happy with the result. However, other classes of software solutions have been released to manufacturing and the process industries so that it is not obvious today that all manufacturing sites will ever need a true process historian. 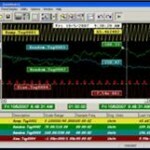 Just as the process historian was the tool of the 1990s for much of our reporting and process understanding – performance management, manufacturing intelligence, and manufacturing execution systems (MES) can collect and correlate some manufacturing data better, faster and more intuitively report it in an actionable format. A process historian is not a relational database. Although you can easily collect discrete data, batch data, product style, machine status and much more – it is cumbersome to built good and fast reporting that will show events, alarms, averages, min/max/totals per product, per job number, etc. Several historian companies have built “solutions” that often de-emphasize, or augment, the actual time-series process historian and build functionality into relational tables thereby producing batch reporting and a number of tracking solutions. These solutions fit more in the area of manufacturing intelligence – but even so they still typically work on the principle of storing “raw” data and then producing a report by calling and manipulating massive amounts of data. Here is a short list of systems that are distinctly different than a historian. Real-time Performance Management Systems – these systems are built on relational databases and configured with a model of the plant systems defining machines, systems, and intelligence needed. Data is collected and key performance indicators are calculated in real-time. The defined key performance indicators are stored in a relational aspect to the system and stored to produce downtime, OEE, TEEP, batch management, labor tracking and more by machine, line, shift, order, product and more. These systems can provide intelligence, i.e. managerial alerting, work instructions, problem escalation and more. They also interface to process historians to show trends in their reporting where appropriate. TrakSYS™ is an excellent system. 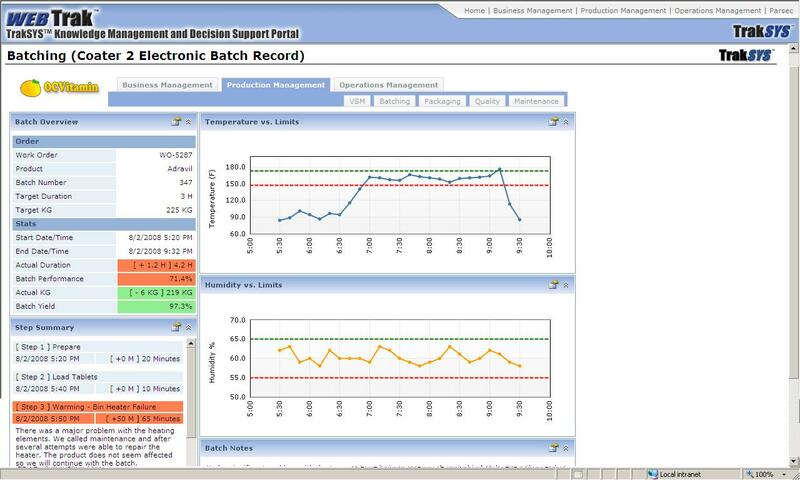 Manufacturing Intelligence System – A manufacturing intelligence system is a product of data connectors and a portal system for users to build dashboards. The system collects data from many disparate real-time and historical data systems, including the process historian, to present information in a dashboard without having to store all the data in one system. Status can be used in this sense for a low-cost, effective manufacturing intelligence system. Manufacturing Execution System – An MES is a system that is configured based on a model of the plant and a relational database. Data is gathered from control systems and it often includes, or is connected to, the scheduling system to allow the MES to track and trace all materials and labor used against an order. The MES gathers and stores all aspects of production on an order. The process historian is an excellent, useful tool for storing large amounts of process, time-series data and being able to present it to the user in the form of a trend or report. Most process facilities need a historian and they usually have excellent payback in ROI based on finding problems. When a historian is the right tool for your need – there are many choices and the lower cost solution is often a better product than the higher priced system. Canary Labs historian is an excellent moderately priced tool.